20 Jun 2016 / 11:45 H.
The machine is accessible by the public at 1Utama from June 16 to 26, and Bangsar Village from June 12 to 24. 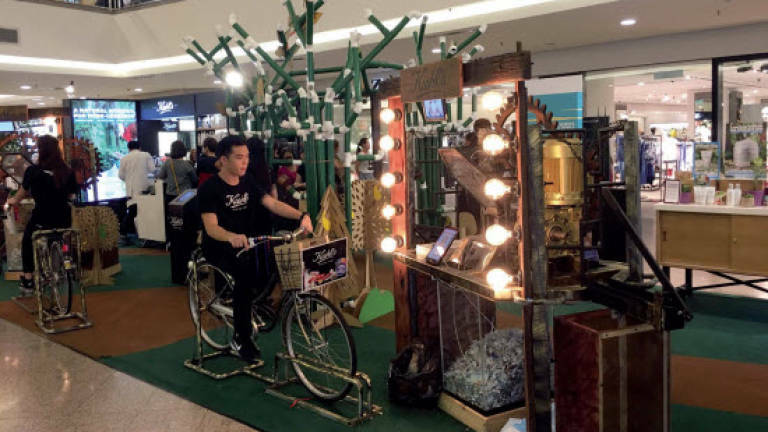 IN line with its long-standing quest to preserve and protect the environment, Kiehl's Malaysia recently introduced 'Working Towards A Better Earth' campaign to achieve a better environment through education and activation. The campaign is headlined by the Kiehl's Every-Tree, a representation of all trees that stands to benefit from eco-friendly efforts of the public as a collective. Kiehl's has launched an interactive website (www. abetterearth.com.my), and an on-ground 'Interactive Recycling Machine', where each action taken digitally or on-ground will contribute towards the growth of the Kiehl's Every-Tree. Designed around the element of 'play', the website hosts a carbon footprint calculator which furnishes tips to reduce the size of our carbon footprint, educational quick-fire games, Kiehl's eco-responsibilities and commitments, as well as locations of the recycling machine. Meanwhile, the 'Interactive Recycling Machine' features a can crusher, and a shredder for plastic bottles that is powered by a bicycle. It was created by social enterprise Biji-biji Initiative – as commissioned by Kiehl's – using new and reclaimed materials. The machine is accessible by the public at 1Utama from June 16 to 26, and Bangsar Village from June 12 to 24. Biji-biji Initiative will melt down collected recyclables and transform them into other goods. "Many aren't aware of the big impact certain lifestyle habits have on the environment. We hope that with a fresh approach, we can educate the public on simple, easy-to-adopt choices they can make, which will make a huge difference to the environment," said Elaine Yong, marketing manager for Kiehl's.